Available in three mounting hole patterns. The widest selection of materials and configurations at a fraction of the price of factory guards and MADE IN THE USA!!!! Despite popular belief, unless one is willing to drill new mounting holes, there is no one-size-fits-all RG style pickguard. We are set up to make the three most common patterns. Generally speaking, Patterns one and two are typically found on Japanese models (there is very little difference between the two). Pattern three is reserved for the lower-end Korean and Indonesian models. Please be aware that this is only a generalization and there can often be exceptions. Above you will find thumbnails that link to printable templates of these patterns. 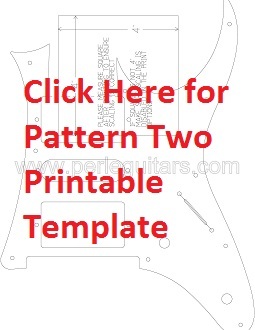 These templates have all the critical features on them to verify that the pattern/general control placement will fit your guitar. If you do not mind performing simple modifications (ie- drilling new, non-invasive pickguard mounting holes), it will not be as important to check the template. 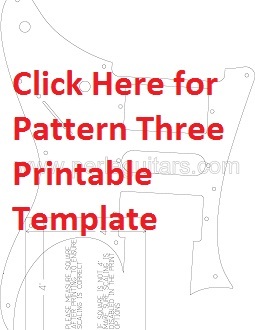 If you do not have the resources available to perform simple modifications or have a collectible guitar that can not be modified it is absolutely critical that you take the time to check these templates to your guitar to verify the correct fit. The pickguard was shipped quickly and built very well. The pick guard is better quality than the original and for the price you can’t beat it. The turnaround was fast with no issues. The PG is a little different from the original which means the hole were not in the same place as the original other than that it worked great and looks awesome. Excellent product. Period correct. Outstanding customer service. If you are in market for for a Period correct excellent quality reproduction ...you have come to the right place! 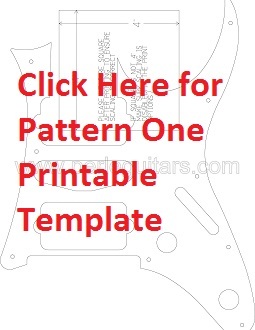 I ordered a pickguard cut with strat single coil setup. It was shipped very quickly and looks great. Pickups line up great with the strings. It actually seems to be better quality than the stock pickguard. If you are thinking of doing this. Just note that you may have to modify the cavity beneath the pickguard depending on the pickups you choose. I used seymour duncans that were larger (depth) than standard fenders pickups. Order shipped promptly. Was exactly as advertised. Fit was perfect, routing was sharp and crisp. ZERO complaints! Absolutely perfect. I can't say a single bad thing about the product or the support. Nate got back to me super fast when I wanted to change a spec with no issues. The pickguard fit absolutely perfectly. It's exactly what I wanted and now the guitar is truly one of a kinda. Bravo. I'll definitely be ordering from Mr. Perle whenever I need something Ibanez related. If it's quality you're after, you're here. If you already verified placement with his template.. then do yourself a favor and stop waiting. Craftmanship and materials are equal to factory quality. Click the button below to add the Custom 6 String RG Pickguards to your wish list.